UPDATE for SPRING 2017: As of late spring 2017, I have transitioned into a full-time position with The Trustees as their Retail and Operations Manager at The Boston Public Market. I want to humbly thank everyone I have worked with over the past decade as Boston's backyard chicken expert... it has been such a delight to meet so many lovely, chicken-loving folks, and I look forward to a time when I can again help further the vision of a flock in every yard! In the meantime, come on by to see me at the Appleton Farms cheese booth or in The KITCHEN at the Market, and if you have questions about keeping backyard chickens I recommend contacting Gretchen over at Chickadee Seed & Feed in Walpole, MA. She is one of the few folks I trust to know as much as I do about keeping a microflock of backyard chickens in an urban or suburban setting (and to have standards of care that match mine! ), and her store is a fantastic resource for well-designed coops, locally-produced feeds, and a variety of other treats and toys to keep your girls happy and healthy. Welcome to Yardbirds Backyard Chickens! We can help you with nearly anything and everything backyard-chicken-related. Need a coop and/or chickens? We can do that. Need a chicken sitter or coop design consultation? We can do that. Need to rehome an unexpected rooster or get help with your permitting? Yep, we do that too. Many of our services are offered through our partner company Green City Growers , so follow the appropriate links on our "Services and Rates" page to request your consultation! 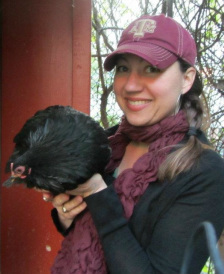 The Chickeness, Khrysti Smyth, with "Lucifer", one of her Chicken Ambassadors. 18 Feb 2017 - Urban Homesteading Festival in The KITCHEN at the Boston Public Market on Hanover St. across from City Hall in Downtown Boston. I'll have a few of my Chicken Ambassadors there for Q&A during the post-conference social from 5:30-7:30pm. More information and ticketing links can be found on The Trustees for the Reservations website. 4 Mar 2017 - Annual Massachusetts Urban Farming Conference at Northeastern University in Boston, MA. I will be presenting first thing in the morning (8:45am), so plan to come early! More information and ticketing links can be found on the Urban Farming Institute's website. 7-9 Mar 2017 - Harvest NE Ag Marketing Conference + Trade Show in Sturbridge, MA. Not presenting at this one. Just going to soak up all the good marketing mojo! For more info and ticketing info check out the Harvest New England website. 18 Mar 2017 - 42nd Annual Gardener's Gathering at Northeastern University. 11am-4pm. FREE and open to the public! For more details visit The Trustees' website here. 22-26 Mar 2017 - Boston Flower & Garden Show 2017 at the Seaport World Trade Center in Boston, MA. We'll have another full coop display as part of their Urban Homesteading Area, and I'll be presenting "Why chickens are the true superheros of your garden!" on Sunday the 26th at 1:30pm. More details and ticketing info can be found here. 1 Apr 2017 - Yardbirds Backyard Chickens 101 at The KITCHEN at the Boston Public Market. My first regular class of the year! 2-4pm, open to the public. Look for more details on The KITCHEN website or go straight to the eventbrite page to register. Space will be limited, so get your tickets ahead of time! 20 Apr 2017 - Yardbirds Backyard Chickens 101 at the Burlington Public Library, in Burlington, MA. 7-8:30pm. Check out their website for details. 22 Apr 2017 - Yardbirds Backyard Chickens Community Garden workshop for The Trustees. 12-2pm. Location TBD (check their Community Gardens Programs website for details as it gets closer to the date). 6 May 2017 - Yardbirds Backyard Chickens 101 for the Southeastern MA Agricultural Partnership (SEMAP). 2-4pm. Location TBD (check their events website for details as it gets closer to the date). Donate to Yardbirds Backyard Chickens! We are working on some big projects this spring, including the development of our own nursery ("chick-ery"?) and grow-out coops at a new location in Milton, MA! This space will directly help us provide more healthy and happy locally-raised raised hens for the citizens of the greater Boston area, and be a huge step towards being able to offer more services to the people who need it. As with all such endeavors, we need money to buy stuff like building materials and shelving and chick feed... maybe a trash can or two... You get the idea. So if you'd like to help us on our quest to bring more chicks to more yards, we welcome you to donate to YBC in whatever amount you'd like. All donated funds will go directly towards materials and operating costs of the Yardbirds Backyard Chickens "Chickery". We are IMMENSELY grateful for your continued support, and please get in touch if you have any questions. If you are local and might have supplies or materials you'd like to donate, we'll be putting up a detailed supplies and materials list on our blog soon and would be glad to help you clear out some clutter! The Chickeness in the news! Jul 2015 - Feature article in Metro Boston! Jun 2015 - Feature article in the Somerville Scout about the growth of urban ag in the city. Apr 2015 - Boston Magazine article about our new partnership with Green City Growers. Mar 2015 - Press release about our new partnership with Green City Growers. May 2013 - The City of Somerville has released its "C is for Chicken: Chicken Keeping in Somerville, MA" video, which features my flock and a clip from a presentation I gave at City Hall last fall. Watching this video is required as part of the permitting process for having chickens in Somerville! Here's a Chickeness blog post with a bit more detail. -- YBC field trip to the annual Boston Poultry Expo at Four Winds Farm in N. Oxford, MA. -- YBC field trip to the New England Bantam Club's Fall Show in Whitman, MA. -- Tabled at ﻿The Trustees for the Reservations﻿' Annual Boston Agricultural Exposition in Dudley Square, Roxbury, MA. -- Tabled at The Urban Farming Institute's Annual Food Day at the Garrison-Trotter Farm, Dorchester, MA. -- Growing the farm at Goddard" presentation for the Massachusetts Assisted Living Association annual conference in Worchester, MA. With Green City Growers and Goddard House Assisted Living. Check out the YouTube video on the Farm at Goddard! -- Tabled at Chickadee Seed 'n' Feed's Annual "Fall Fur 'n' Feathers Festival" in Walpole, MA. The best feed store in the region! -- YBC Backyard Chickens 101 class for the Braintree Farmer's Market in Braintree, MA. -- Growing the farm at Goddard" presentation for the National Center for Creative Aging annual conference in Washington, DC. With Green City Growers and Goddard House Assisted Living. Check out the YouTube video on the Farm at Goddard! -- YBC Backyard Chickens 101 class for Mass Audubon at the Blue Hills Trailside Museum in Milton, MA. -- YBC Backyard Chickens 101 class for the Sally Frank Farmer's Market at Bowden Park in Melrose, MA. -- Field trip to the monthly Northeastern Avicultural Society swap in Westford, MA. -- YBC Backyard Chickens 101 class for Somerville's Urban Ag Ambassadors program. -- Invited participant in a discussion of Communication and Negotiation with Tufts Veterinary Students as part of their Legal Basis of Public Health course. -- Participated in the first Backyard Chickens Working Group meeting as part of the City of Cambridge's Urban Ag Task Force zoning update process. -- Attended the 6th annual Slow Living Summit on Food and Ag Entrepreneurship in Brattleboro, VT.
-- Officially opened the new Yardbirds' Chickery space in Milton with the hatching of our first batch of Easter Egger chicks on Easter weekend! This space is where we will be raising hens for our clients, as well as serving as a home base for our flock of Chicken Ambassadors. -- Attended the Urban Farming Institute's 4th annual Urban Farming Conference at Northeastern University in Boston, MA. -- Had a full coop display and gave my "Why adding chickens to your garden is a GREAT idea" presentation at the Boston Flower and Garden Show at the Seaport World Trade Center in Boston, MA. -- Attended the 9th annual SEMAP Agriculture & Food conference in Dighton, MA. -- Field trip to the annual ﻿Northeastern Poultry Congress﻿ spring show - chickens and turkeys and ducks, oh my! -- Field trip to the annual Boston Poultry Exposition fall show - chickens and turkeys and ducks, oh my! -- Attended a Mass Dept of Agriculture seminar on Avian Influenza. Summary and highlights to come soon. -- Presented at the Tufts Vet School One Health Day. Presentation title: "Companion and food animal medicine: Why chickens are in the middle of the road"
-- Attended the New England Bantam Club fall meeting. -- YBC's Backyard Chickens 101 class at Green City Growers on 6 Oct from 6:30-8pm. Stay tuned for news about our next class! -- Fun times with Lucifer and Sweet Pea at the Urban Farming Institute's fall Food Day event at the Garrison-Trotter Farm in Dorchester. -- YBC's monthly Backyard Chicken Social featuring Daniel Mordarski of Tufts Vet School talking about his recent work on lead in backyard chickens. He'll be summarizing his work thus far in a guest blog for us sometime soon, so keep an eye out for that. -- Attended the LeadingAge awards event with the Goddard House Assisted Living Facility - their garden and chicken coop program was nominated for LeadingAge's Innovative Program of the Year and we're so proud to have been able to be a part of its development! -- Presented for the Massachusetts Environmental Health Association's Annual New England Environmental Health Yankee Conference. Our all-day Urban Agriculture track with Jessie Banhazl of Green City Growers, Noah Wilson-Rich of Best Bees, and Elaine Philbrick of The Goatscaping company was a HUGE hit! -- Had a table at Agricultural Hall's annual Urban Ag Fair at the Loring Greenough House in Jamaica Plain, MA. Love that fair. -- Attended the FINAL meeting of the Boston Urban Ag Visioning Steering Committee on the future of Urban Agriculture in the City of Boston! Check out the Boston Urban Ag blog for more info and to see how you can get involved. -- YBC Monthly Backyard Chicken Social CANCELLED for the summer. Save Sept 8th on your calendars for the next monthly social event! -- Visited the Brockton Fair to say hello to all the awesome exhibition birds and offer a few of our foster chicks for people to meet. -- YBC's Backyard Chickens 101 class at Green City Growers on 30 June from 6:30-8pm. Stay tuned for news about our next class! -- The Chickeness joined Green City Growers at the Fenway Farm to do some maintenance during the Red Sox' game against the Atlanta Braves. -- Attended the June meeting of the Boston Urban Ag Visioning Steering Committee on the future of Urban Agriculture in the City of Boston. Check out the Boston Urban Ag blog for more info and to get on the list for upcoming meetings. -- YBC field trip to the annual "Sharkie" chickenstock. This year it was in Claremont, NH and was a great place to check out birds that local hobbyists and breeders have for sale, as well as get to know the regional chicken-keeping community. Find more info on the BackyardChickens.com forum thread. -- New England Bantam Club spring poultry show! At the Brockton Fairgrounds in Brockton, MA, details available on the NEBC Spring Show Facebook event here. -- YBC Monthly Backyard Chicken Social in the lovely urban oasis of the soon-to-be-former YBC home coop, The Menagerie. -- YBC's Backyard Chickens 101 class for Somerville's Urban Ag Ambassadors program. This program is closed for this year, but check out the Somerville Loves Urban Gardening facebook page, or follow the Somerville Urban Ag blog for info on next years' program. -- The Chickeness moves to Dorchester, and the YBC home coop moves to Brighton!! Whoa nelly was THAT a project! -- Boston Urban Ag Visioning Steering Committee and Public Meeting on the future of Urban Agriculture in the City of Boston. Go to the Boston Urban Ag blog for more info. -- Get Growing! festival at the Cambridge Winter Farmers Market. --YBC's Backyard Chickens 101 class. Get a rundown of everything you need to know to keep your own chickens, including housing, breeds, feeding, healthcare, etc., with a couple of my girls for you to meet as well! Class is from 6:30-8pm at Green City Growers near Union Square in Somerville. $40 advance tickets, $45 day-of. Space is limited, so register today! -- YBC relaunch! Brawk in business! Check out more details on The Blog of The Chickeness. -- Yardbirds' monthly backyard chicken meetup at Relish. Featured topic: "What substrate should I use in my run?". -- Yardbirds' inaugural monthly backyard chicken meetup at Relish! -- YBC's home coop was a featured stop on the Somerville Garden Club's annual Garden Tour! -- Roxbury and the Beacon Hill/Chinatown/Downtown/North End/West End/Charlestown neighborhoods had their neighborhood meeting about Boston's urban agriculture rezoning process - please go here for more info on the new Article 89, and here for a pdf flier about the neighborhood meetings happening all over the City of Boston (the flier is also linked at the bottom of the BRA website on Article 89). Please come out and voice your support for urban agriculture, especially chickens! -- Yardbirds' June "Backyard Chickens 101" class at Relish. -- YBC table at the Get Growing! festival at the Cambridge Winter Farmers Market. -- YBC presentation for Somerville's Urban Ag Ambassadors program. -- YBC kids! program for a class of 1st graders at The Brown School in Somerville, MA. -- YBC table at the Somerville Winter Farmers' Market. More event info on the Somerville Urban Ag blog. -- Presentation for the Somerville Garden Club. -- DIY demo at the Boston Local Food Festival on the Rose Kennedy Greenway. -- Somerville Community Growing Center's Annual Harvest Festival.